The high quality of our work is the result of our business being operated solely by its owners, Ed and Red. These partners each have over 30 years of experience, and have been El Cajon's experts for patio covers, patio rooms, door hoods, window awnings, and carports. They can be trusted to design a shade solution that complements homes and businesses of any size, meets all expectations for functionality, and gives the best return on investment. Aluminum is the ideal choice for patio covers among El Cajon home and business owners because it retains the patio covers' beauty, shape, and durability for decades with little to no maintenance. Unlike those made of wood, fabric, or iron, aluminum patio covers and awnings resist corrosion, water damage, bubbling, rotting, and bug infestations. Yet, they are still highly versatile, coming in a variety of shapes, textures, styles, tops, end cuts, colors, and column types. Because Aluminum City is an authorized dealer for Four Seasons Building Products, we provide durable patio covers and other products of the highest quality, backed by lifetime limited warranties. As licensed, bonded, and insured Aluminum City, our professionals will install your El Cajon patio cover, patio room, carport, door hood, or window awnings with a quick turnaround and personalized customer service. 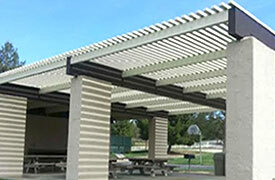 Call today to have them help you plan and design your outdoor shade structure. Our pricing is usually less than most other San Diego patio cover companies and yet our quality is unmatched. Estimates are free. We look forward to hearing from you. At Aluminum City, we provide El Cajon homeowners and businesses with beautiful, no-maintenance, and long-lasting patio covers at some of the lowest prices in San Diego County. Our patio cover experts have decades of experience designing and installing both freestanding and attached patio covers, and can be relied upon to help you make the best decisions regarding your new patio cover. With our help, we'll make sure you get a well-constructed, durable patio cover in the right style, color, texture, and size to complement your home or business. We'll also help you consider other options, such as end cuts, skylights, ceiling fans, and lights. As an authorized dealer for Four Seasons Building Products, you can rest easy knowing your patio cover is better made than any others on the market. 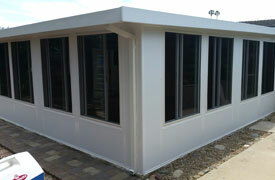 Their patio covers are durable and backed by a limited lifetime warranty. 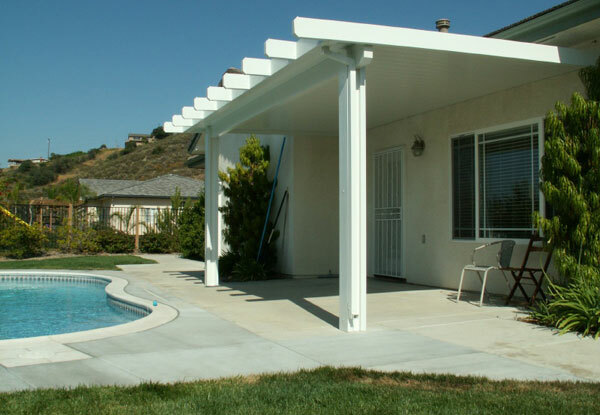 Call today to inquire about our El Cajon patio cover sales and installation services. 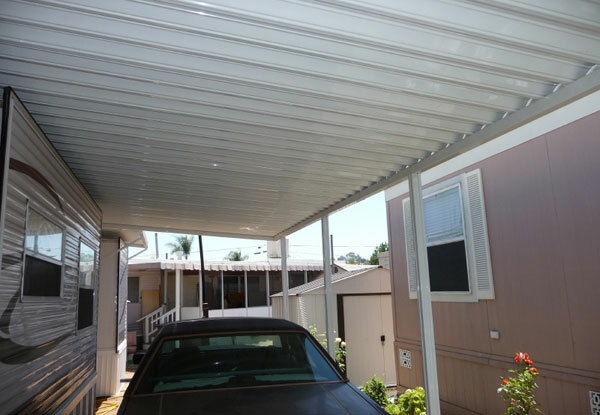 Let the structured shade specialists at Aluminum City help you to protect your cars, trucks, boats, recreational vehicles, motorcycles, commercial trucks, machinery, sensitive equipment, and more by designing and installing a customized canopy for your residential or commercial property in El Cajon. Our highly durable custom-made carports are excellent solutions for sheltering property from the sun and rain as well as increasing privacy. At Aluminum City, we use premium-grade materials provided by Four Seasons Building Products to create our carports. Their materials are backed by a Lifetime Limited Warranty. 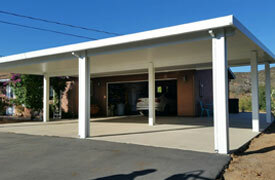 Call us today to install a new carport on your El Cajon property. We look forward to hearing from you. 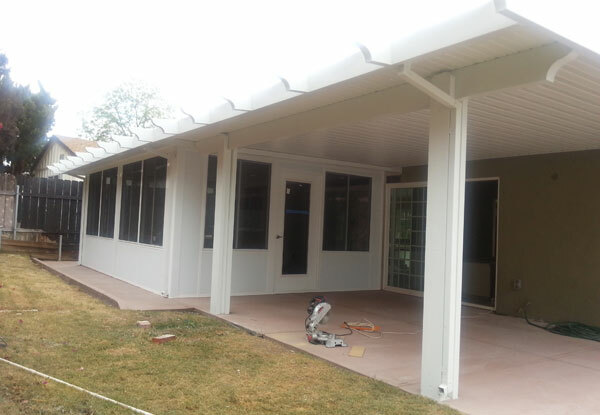 Rely on the structured shade experts at Aluminum City to install a custom-made, high quality patio room enclosure at your residential or commercial property in El Cajon. Our beautiful and durable patio rooms are built to code, insulated, and equipped with gutters for proper handling of water run off. They can be built with dual-glazed, low-E glass windows; regular, glass, sliding glass, or French doors; and an electrical raceway, making it easy to hook up a ceiling fan or lights. Call today for a free price estimate. Trust Aluminum City to custom-design and install attractive, high quality door hoods for your El Cajon home or business. Our highly skilled staff will not only design a customized door hood to perfectly complement your property, but will also provide expert installations with a quick turnaround. Using high-grade aluminum materials from a trusted local manufacturer, our door hoods are fabricated from 3 ½" aluminum slats and fixed at a 45 degree angle with side walls. 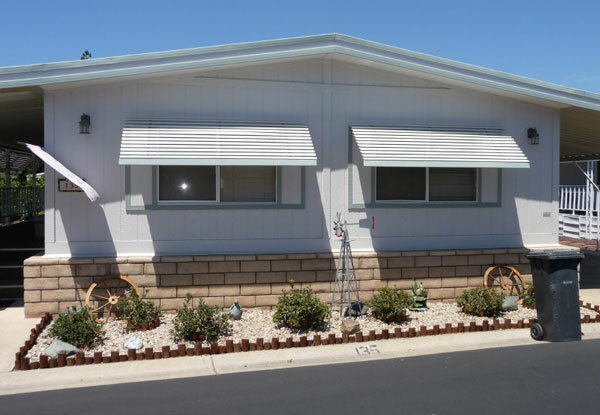 We have served thousands of satisfied clients throughout San Diego County and receive great feedback on how our high quality door covers offer shade to guests and provide protection from the sun's harmful rays. To learn more about Aluminum City's door hood designs and installations, give us a call today. We offer El Cajon the best value on window awnings for both commercial and residential properties. Our window awnings feature experienced design and installation techniques with quality craftsmanship, a quick turnaround time, superior customer service, and highly competitive prices. Our awnings are made of durable aluminum slats that come in twenty different colors. Once these slats are combined and installed, you can rest assured that your finished awning will perfectly fit your window, complement your building's façade, and meet your functional needs. At licensed, bonded, and insured Aluminum City, we're known throughout El Cajon and the rest of San Diego County for our unmatched customer service. Our highly experienced staff is dedicated to producing excellent work and prioritizing customer satisfaction. Call today to learn more about how window awnings can benefit your commercial or residential property in El Cajon. Aluminum City offers homeowners in El Cajon a wide range of outdoor shade solutions, including patio covers, carports, patio rooms, window awnings, and door hoods. This collection of shade structures is not only effective at beautifying, cooling, and shielding outdoor areas, but also surprisingly cost effective. They can reduce your energy usage, expand your square footage, and increase your home's property value. As an added bonus, they require little to no maintenance. 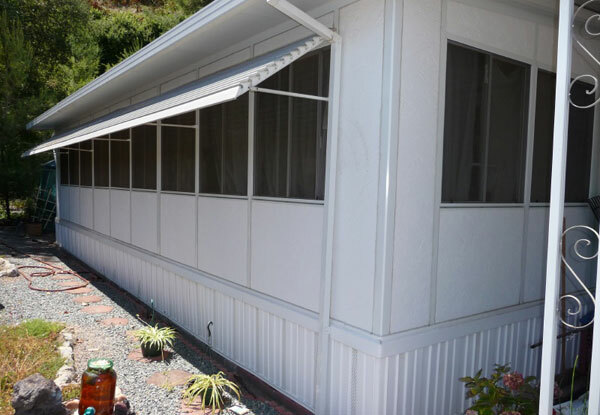 With more than four decades of business experience, Aluminum City can be relied upon to deliver long-lasting, durable, and sophisticated residential patio covers, window awnings, door hoods, carports, and patio enclosures in El Cajon at some of the best prices in San Diego County. Give us a call today to schedule your free estimate. 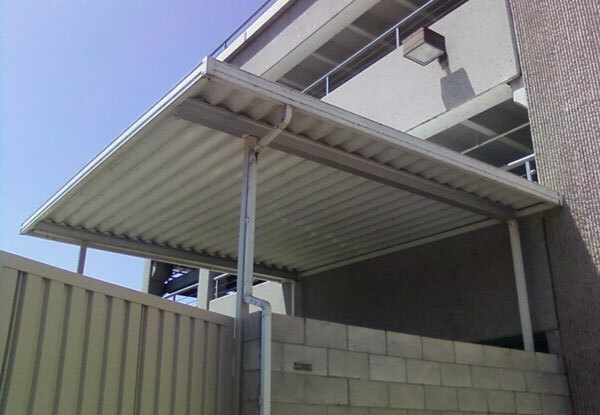 Aluminum City has provided businesses in El Cajon with exceptional patio cover, patio rooms, carports, window awnings, and door hoods at an unbeatable price. Once installed, our shade solutions will look beautiful and well balanced, require little to no maintenance, and last for decades. What makes aluminum particularly ideal for outdoor applications is that it is durable yet lightweight; resistant to rot, termites, and rust; and usually backed by excellent warranties. At Aluminum City, our patio covers, carports, and patio rooms come from Four Seasons Building Products, a manufacturer that goes above and beyond to deliver superior value. The aluminum materials used in their patio covers, carports, and patio rooms exceeds the industry standard for thickness and features baked on enamel and paint. Additionally, they back their products with a Lifetime Limited Warranty. 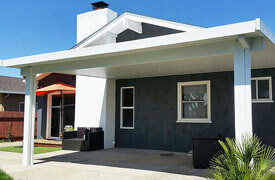 When their exceptional shade solutions are matched with our experience installation techniques, El Cajon businesses can trust they'll enjoy the best return on their investment. Call today for a free consultation in El Cajon. This is an aluminum cover for a commercial business in El Cajon, CA. We attached it to the parking structure, and it includes 4" posts, and a built in gutter for erosion control.